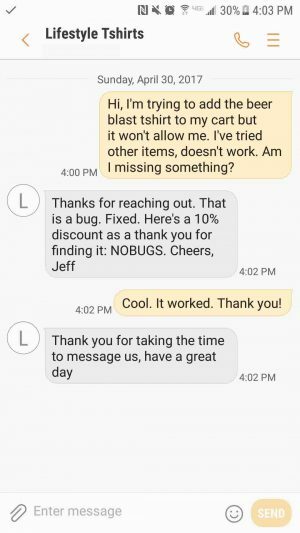 We realize it’s obvious to us that texting is a great customer service solution. We have all this data from our customers and these amazing testimonials and case studies. But for those who don’t live and breathe it every day, it’s not that obvious. Why and how does such an old technology, with no bells and whistles whatsoever, become the most effective way to communicate with customers? Ubiquitous. Texting is at the tip of everyone’s fingertips. No app needed, not even a smartphone. 4.3 billion people worldwide can text. For comparison, only 1.3 billion use Facebook Messenger). 95% of Americans own cellphones, only 79% are on Facebook and only 53% login to Facebook every day (Source: Pew Internet Research). This is not to say your business should not be on Facebook – It absolutely should be (that’s why we have native Messenger integration). However, texting is still a bigger channel. Smooth. Widget follows shoppers as they browse, ready to spring into action when needed. They do not have to jump around the site to find contact info so there’s less risk of losing them, especially on mobile. 98% of texts are opened. Better than email. Only 30% of emails are opened. Better than Messenger. Only 90% of Messenger messages are opened. Authentic. When customers leave the live chat window, you lose them. With texting, they are always reachable and you get their real phone number, not a fake email. Better than calls. Do you like calling businesses? Probably not. Pretty much everyone hates it. Waste of time for you, waste of time for customers. Start a text conversation first and move to a call only if needed and worth your time. Personal. More than any other channel, texting feels like a conversation a friend. In instant messaging apps and in email, there’s always a company logo or a generic email. The bare bones nature of texting is what keeps it authentic, personal, and thus trustworthy and effective. Asynchronous. Customers can send a quick text whenever is convenient for them be it 2am in the morning or at 2pm right before going into a meeting. They don’t need to know your email address or type in any number or fill out an annoying form – just click and send. Businesses can respond in real time or asynchronously – a few minutes or hours later – without needing 24/7 support staff. In fact, our research shows that customer satisfaction rates are higher with texts than with live chat even when response times are exactly the same. That’s because in live chat there’s always an expectation for an immediate reply but with texting customers are fine with waiting while they go back to their regular activities. Clean channel. As long as you follow anti-spam laws, texting is a clean and reliable channel. Messaging through other people’s apps means you are sharing your data with them, you are subject to their rules, and to their blocking decisions. For example, Facebook Messenger is a fantastic messaging application. However, many of our businesses prefer texting because 1. they don’t want to share their data with Facebook or 2. are worried Facebook will start charging for it 3. are concerned that if they get blocked for some reason, they will lost access to their customers. Here to stay. No matter how successful a certain app is, no matter how cool some platform is at the moment, there will never be one app that all of your customers use. The only universal messaging solution is native texting. That’s why it’s here to stay and it’s never going away.